DUG Insight User ManualFrequently Asked QuestionsFrequently Asked Questions PolygonsHow do I find out the area and volume of a polygon? You can obtain the area and volume of a created polygon from the Map View (see Measuring in the Map View). Under Region, select the polygon you wish to use. In the Results section, select the Area check box to calculate the area in the polygon. 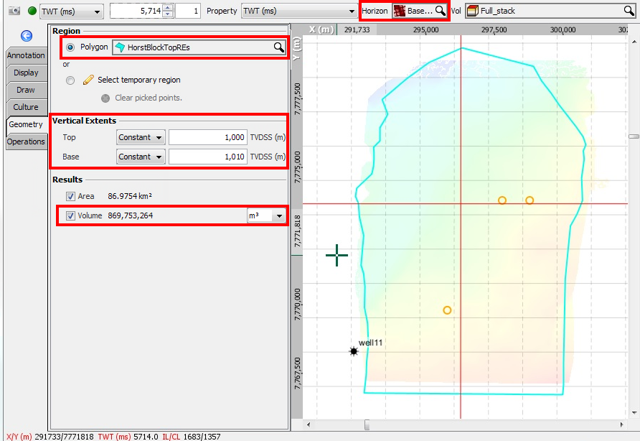 To find the volume within a polygon, select a Horizon in the navigation bar of the Map View. Open the Geometry tab and select the polygon you wish to use. 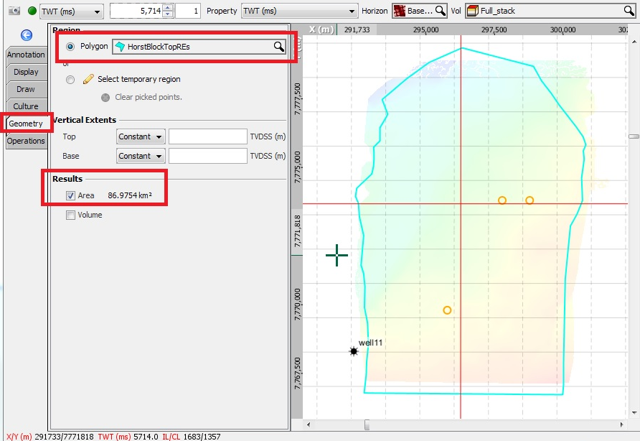 In the Vertical Extents section, define the Top and Base boundaries using a constant or a horizon, or both. Select the Volume check box in the Results section to calculate the volume. Next: How do I convert culture polygons into regular polygons?